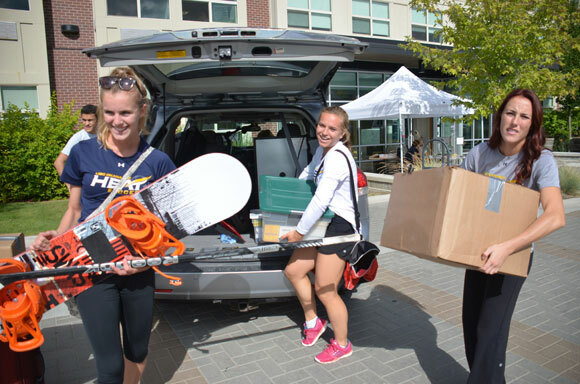 Student move-in day is a well-choreographed event at UBC Okanagan that happens the first Sunday in September and marks the beginning of the new academic year. When: Sunday, September 6, 8 a.m. to 1 p.m.
It’s the first day of their new lives as university students. And it can be complex, emotional, and a lot of fun. Student move-in day, the date when all students living in residences can move to campus, takes place Sunday, September 6, beginning at 8 a.m. Unlike previous years, when only first-year students moved into residences on the first Sunday of September, this year all students living in residence, regardless of year, will be moving in. They will arrive in waves — organized by the first letter of their last name — and by 1 p.m. the last load should be ready to go. Shannon Dunn, Director of Business Operations at UBC’s Okanagan campus, says they are expecting more than 1,200 students to move in on Sunday alone. But now, 10 years in, it’s a well-choreographed event. Dunn notes that much of the campus gets involved as upper-year student volunteers from various organizations, including Heat Athletes and Orientation Leaders, work hard to help move boxes and support those new to campus. Once the boxes are ready to be unpacked, students are expected to attend a floor meeting in their residence. And all parents are welcome to attend a parent conference at 2:15 in the gym. Ian Cull, associate vice president of students, says this year UBC administration is also encouraging parents of regional students (those who will commute to campus) to attend the parent conference. It’s important that all parents are aware of the support system and strategies that UBC has set in place for the students. After the initial welcome, information sessions with topics ranging from financial information, student wellbeing, campus life, and academic expectations, are open for the parents to attend. The day wraps up with a complimentary family picnic for parents and students in the courtyard.